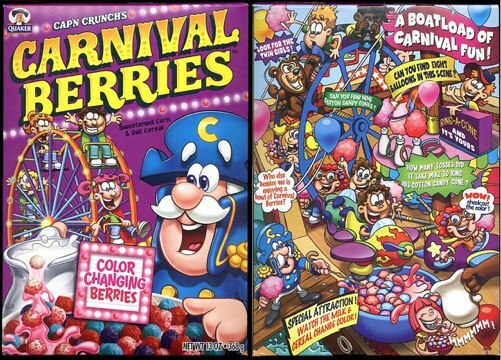 Who doesn’t love a color changing cereal? It’s dumped into the bowl one color and boom, before you know it, your milk has changed your breakfast into a completely different hue. But it’s your milk itself that tells the tale true, as it is now tinted the original color of the previously dry crunchies. That’s because the first shade was a powder applied to the cereal, since washed away to reveal the second stage. But if you have any designs on making your own version of this fun breakfast classic, think again, the process is patented by Quaker Oats. The patents in question were granted first to Hideo Tomomatsu of Crystal Lake, Illinois and then to the team of Joseph Farinella of Chicago, Illinois and Justin French of Cedars, Iowa through the late 80s and 90s. You are currently browsing the archives for the Cereal category.